“When a teacher asked his pupils to bring in a book from home, one nine-year-old brought the Argos catalogue, saying: ‘It’s the only one we’ve got. '”City of children who cannot read – London Evening Standard. One million cannot read in London, one in four children are illiterate. Hay Festival: Duchess of Cornwall promotes literacy – BBC. “The duchess flew in to the book festival by helicopter to read to children… the duchess regularly visits schools and libraries and encourages reading and reading aloud.” Also reported in the Telegraph. Strong libraries can co-exist with new technologies – Scotsman. Cambridgeshire – 7% cut in opening hours. Consultation ends 18th June 2011. City of Westminster – Petition to save St James’ Library. Lancashire – £29k cut by cancelling all magazines apart from Which? Leicestershire – £1 reservation charge for children and pensioners. Wiltshire – 21 out of 31 libraries will have reduced opening hours, self-service to save £300k p.a. with c.15FTE job losses calculated from £300k figure. Cambridgeshire – Library open hours consultation – Cambridgeshire Council. Consultation does not give option to oppose cuts, asking instead (for example) which day one wishes the library to be closed early. Cumbria – Writers asked to support campaign against library closure – New Writing Cumbria. Overview of situation in Cumbria. Dorset – Poor response to libraries’ rescue – Daily Echo. 16 out of 20 threatened libraries do not have volunteers willing to run them. Lancashire – Magazines to be axed from Lancashire’s libraries – Citizen. Leicestershire – Library users in Leicestershire hit out at book fees – This is Leics. Pensioners and children to be charged £1 to reserve books. “The money they will make is just a drop in the ocean of what they need to save, but they have decided they will get that from pensioners and kids. They are probably the people who can afford it the least.” Reservations down 20% since introduction. Oxfordshire – Libraries consultation delayed for fourth time – Henley Standard. Oxfordshire – Villagers support fight to save library from closure – Henley Standard. 300 sign petition to save Benson Library last Saturday. Wiltshire – Libraries to get automated service – BBC. £500k installation of self-service machines in order to save £300k p.a. “”It will mean that we will lose some staff. Many are part time and we don’t know how many it will equate to.” – Library Assistant = £20k (with “on-costs” of pension etc). £300k divided by 20 = 15 FTE staff lost. 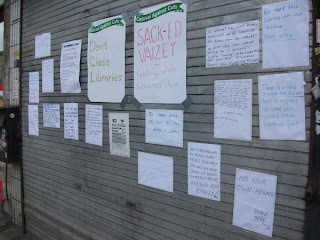 Lewisham Council have closed New Cross Library a day early in order to avoid a planned demonstration. Children who came to take out books and students who came to study were met with a shuttered facade. Over the course of the day, the front of library was covered with protesting notes like the one above. Heartbreaking. A group of volunteers wish to reopen the library but, faced with a bill for rent alone of £16,000 per year, they face an uphill struggle. Meanwhile, 150 people formed a human chain around near-namesake Bromley Cross Library in Bolton as a protest against plans to close it. The circling vulture of library closures moves on to another target. National Libraries Day – Voices for the Library. Pint of bitter and a juicy murder story, please, librarian – Independent. “Chris White, from the Local Government Association, said: “The definition of a library does not have to be confined to a municipal building full of books. Opening up libraries in shops, sports centres, village halls and even down at the local pub means that far more people can benefit from the library service councils provide.”. Very strong pro-library comments show what people think about this line of argument. Top children’s author Philip Ardagh from Tunbridge Wells slams cuts to children’s library service – Your Canterbury. “”I appreciate money is tight for everyone but it’s a false economy to make cuts to school libraries because it will have a negative effect on the rest of a child’s life. Why can’t intelligent writers talk sense about politics? – Independent. Christina Patterson completely misses the point of Alan Bennett’s comment about closing libraries being “child abuse”, repeating claims libraries are (a) empty (strange so many are protesting then) and (b) full of middle class people (why is that a bad thing?) and (c) better to close than cancer treatment units (reducing the argument to absurdity, this is the rightwing equivalent of comparing cutters to Hitler). Bolton – Closing this library is not okay in our book – Bolton News. 150-strong human chain around Bromley Cross Library organised by 65-year old Janet Allison. 4000 (30% of total population of area) have signed petition to save it. Letter also covers same story – Join library and save it!. Cambridgeshire – Yaxley residents unite in bid to save library – Evening Telegraph. Large crowd of 100 upset by cuts in opening hours, danger to service and to library staff jobs. Central Bedfordshire – Shhh it’s time for the Big Library Debate – About My Area. Consultation launched on future of councils’ libraries. Doncaster – Bawtry: Library support team to meet – Star. Bawtry is on closure list, steering committee established to run it with volunteers. Essex – County Hall cuts opening hours at 51 of its libraries – Brentwood Weekly News. 27000 responded to consultation and (unsurprisingly) chose less opening hours rather than closures. Council is using this as justification to cut hours and hopes volunteers will help. Isle of Wight – Latest – Alan Gibbons. DCMS talkling to Isle of Wight council about closures. Campaigner may get to talk to Ed Vaizey, pro-library councillors not allowed though. Lewisham – Action at New Cross Library on Saturday 28th May – LACA. Council permanently closes library one day early in order to avoid protest. Lewisham – A “big society” vision for New Cross library – East London Times. New Cross People Library’s Committee has 20 volunteers and is looking for more, in order to reopen but rent would be £16,000 per year. Also covered in Transpontine. Oxfordshire – Campaigners cautiously optimistic – Oxford Mail. Suffolk – Library consultation methodology FOI – wikiSuffolk. Consultation questions and how the answers will be analysed. Warwickshire – Community library groups are frustrated: help them understand? – What’s in Kenilworth. Hidden costs of running a library is putting off volunteers. Wokingham – Privatisation plans for Wokingham borough libraries approved– Reading Chronicle. Finding adventure in every page of a library book – NYPL (USA). Future of library services in the Big Society – NSA, 6th National conference. The speaker on “supporting community libraries” is from Lewisham. This is the authority giving three libraries to a small computer recycling company that the council’s own documents suspect is not up to the job, giving another to an old people’s charity and closing a fifth. The authority was summoned by the DCMS to explain their actions. Hard line on legal aid for library battles – BookSeller. Legal Services Commision is asking for over 50% contributions despite agreeing eligible for legal aid. Comments point out that, in effect, councils are using tax money to defend cases by taxpayers paying an extra tax in order to question the misuse of tax. Meanwhile the Worst Libraries Minister in History continues to do nothing. “Are we actually saying that in 21st century Britain someone’s mistress and keeping personal secrets are more important than opening, to proper public scrutiny, the damage that the loss of these libraries will cause to us all?” Patricia Richardson. OFSTED: libraries the key for “keen readers” – BookSeller. “A new Ofsted report into the teaching of English, “Excellence in English”, has highlighted schools’ investment in books, home reading, book borrowing from the school library and events such as book fairs and storytelling events as instrumental in helping children develop as “keen readers”. Putting the pieces together: my LISNPN competition entry – The Hobbit Hole. Great pro-libraries jigsaws being made. Oxfordshire – Plus 16 to list of threatened libraries – Complicated proposals (under consultation) mean 16 libraries (Adderbury, Bampton, Benson, Burford, Charlbury, Deddington, Goring, Hook Norton, Kennington, North Leigh, Old Marston, Sonning Common, Stonesfield, Watlington, Woodcote and Wychwood) to move from being council-run to being run by volunteers over a three year period. 5 libraries (Chinnor, Faringdon, Grove, Wheatley and Woodstock) to be staffed partly by volunteers. The remaining 22 libraries to remain as fully public libraries. Southampton – Minus 1 to list – Millbrook Library reopened on another site with increased opening hours, staffed by council staff and volunteers. Swindon – Opening hours in some libraries extended by changes in staffing. Volunteers to be used to extend hours and reach. Worcestershire – Plus 1 to list – Wythall Library under threat. Now 5 under threat in county – St John’s, Warndon, Pershore and Broadway already endangered. Doncaster – Consultation over library cuts “biased” – Star. Gloucestershire – Prestbury Library will be used as a “guinea pig” to road test the new volunteer-run services following a raft of public sector cuts – This is Glos. “Villagers will be used to tidy shelves, repair books, process new titles, co-ordinate their fellow volunteers and organise book sales to get rid of old stock.” Volunteers may double opening hours of 12 hours per week. Oxfordshire – County council says axed libraries may stay open – BBC. Five more libraries to be staffed mainly by volunteers – Burford, Goring, Hook Norton, Watlington and Wychwood. This joins list of Adderbury, Bampton, Benson, Charlbury, Deddington, Kennington, North Leigh, Old Marston, Sonning Common, Stonesfield and Woodcote that will move from being council-run to being volunteer-staffed over a three-year period. Chinnor, Faringdon, Grove, Wheatley and Woodstock will remain run by council staff with volunteer support. “You can’t open minds with a closed library” Friends of Somerset Libraries. Suffolk – New leader launches county council in new direction – EADT. “New Strategic Direction” that would have closed 29 libraries now stopped. Surrey – County council announces WiFi deal for libraries – Surrey Herald. Surrey – Call to collect £100,000 in unpaid library fines – Surrey Today. £721k owed in Surrey. 9000 stolen books too. Swindon – Strategy outlines Swindon borough council’s library pledge – Alan Gibbons. Opening hours extended by staff changes, volunteers to be used to extend hours and reach. Warwickshire’s future? – courtesy of What’s In Kenilworth. Warwickshire – Libraries confirm workshop is free for everyone – What’s in Kenilworth. Council decides against charging people to learn about how to do take over libraries. Wokingham – Privatisation plans for Wokingham libraries approved – Bracknell News. Councillors vote unanimously. Worcestershire – Woodrow Library is safe but others may be “community-run” – Redditch & Alcester Standard. National Libraries Day launched. Somerset campaigners appeal for funds. Alan Bennett condemned for “closing libraries is child abuse” comment – Mail. Report, again, on the Newsnight article. For the record, Mr Bennett did not claim that closing libraries was the same as child sexual abuse although, admittedly, may would presume he meant it that way. Circus Stars – The summer reading challenge for public libraries, 2011. Don’t write libraries off yet – Mature Times. 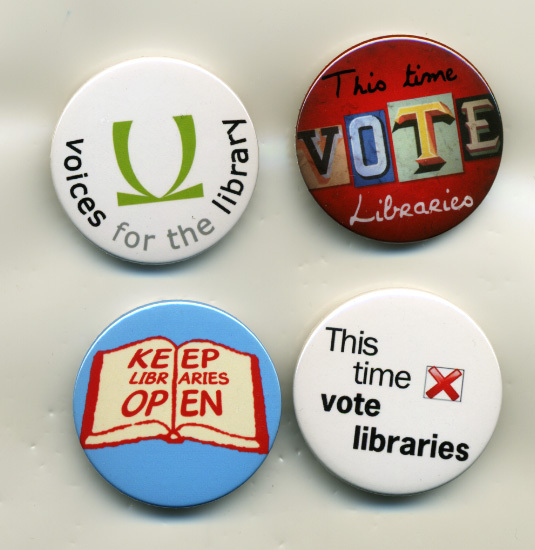 Summary of the situation in libraries shows councils have made some u-turns. Also in the same issue is Shelve free drinks to save libraries. Suffolk has spent nearly £60,000 on free employee drinks that could be used a better way. Government scraps duty to inform, consult and involve local people – False Economy. Libraries face growing demand for ebooks and complicated rules about using them – Vancouver Sun (Canada). Meanwhile, the San Francisco Public Library… The Rumpus (USA). Probably the most beautiful guide to why public libraries are important I have seen. Quotations about libraries and librarians – IFLA. “We see National Libraries Day as a positive day of celebration to promote the whole culture of reading for pleasure, information and engagement whether you read your traditional books or on your laptop or e-reader. It is time to make reading a universal culture. We want people to go to their local school or public library and use their School Library Service. Use it. Join it. Love it.” Support for National Libraries Day – BookSeller. Why don’t more author and publishers “get” libraries? – Loudpoet (USA). Libraries offer things useful for the author/publisher that ebooks/bookshops don’t – they allow easy browsing, learning how to use computers, they offer a wider variety of stock – and so should be cherished. However, few authors/publishers have really got behind libraries in the way that is needed fot them to survive. Camden – Volunteers will be necessary to maintain library service. Barnet – Councillor Robert Rams admits Barnet library plans may not have “universal enthusiasm” after protest on Saturday – Times Series. 400 at protest at Friern Barnet on Saturday. Councillor would welcome a talk with them. Comments after article make an interesting read showing how polarised the debate has become – those people who don’t use libraries resent those that do or don’t believe they actually do. Camden – “Help!” Ed Vaizey refuses to answer library questions – Camden New Journal. Doncaster – Council want library views – Doncaster Free Press. Essex – Library leaflet encourages scores of new volunteers – Yellow Advertiser. 100 people start volunteering (in the community, not libraries) due to leaflet. Leeds – Joy as Leeds Library saved – Yorkshire Evening Post. Rawdon Library’s closure delayed for a year. ““We’ve won the battle but we have not won the war.” says campaigner. Lewisham – Deadling looms for Lewisham library closures – BookSeller. DCMS appears set to fail to intervene in Lewisham or even tell campaigners that it won’t intervene. Somerset – Friends of Somerset Libraries appeal – Alan Gibbons. Somerset campaigners need to raise £5000 or their legal appeal about the closures will fail. “Probably the single most controversial issue has been libraries. Again we are listening to what people are telling us. And we are hearing that libraries are vital to communities across Suffolk. Not just as places that lend books but as social meeting points. A place where people of all ages are able to interact. Again our thinking has evolved. So, it will not be about closing libraries – but about exploring every available opportunity to keep them open. That is why we are considering the setting up of a community interest company that could work in partnership with communities to ensure that as many libraries as possible remain open and are able to flourish.” Suffolk – New county council leader Mark Bee signals change of direction – Evening Star. Warwickshire – Future of libraries in Warwickshire: have you had your say? – Warwick Courier. Consultation ends on June 9th. “There has already been strong interest from smaller communities threatened with the loss of the service who are preparing business plans with a view to running their own library with the help of volunteers.” 1500 physical and 1700 online questionnaires returned. Worcestershire – Lottery grant may keep library open – Worcester News. £1.49m spent on threatened library last year. Council may need to pay back money to Big Lottery Fund if it closes it. Report on library service presented to council today. Voices for the Library reports on a shocking Private Eye article that Ed Vaizey, the minister for libraries, has not had one meeting with library campaigners in the last year. What has he been doing when the libraries he has in charge of have been under threat and in the news as never before? Apparently, he is the “most-lobbied” minister in the whole government – but not by voters, just private companies. He has had seven meetings just with Warner Bros alone during the same period. Yesterday’s discussion of public libraries at Kensal Rise Library and on Newsnight has already been the subject of an article earlier today on Public Libraries News. It as covered in the Telegraph as Alan Bennett: closing libraries is tantamount to “child abuse” , in the Mail as Shutting libraries is child abuse and in the London Evening Standard as Library closures like child abuse, says Alan Bennett. The Bookseller notes the success of the programme in raising the issue in a short article titled Bennett’s Newsnight library defence becomes Twitter trend. To help raise money for the legal challenge to save Kensal Rise and other Brent libraries, see Brent SOS Libraries. Ebooks in libraries – Facet Publishing. New book published. Libraries news – Private Eye (not available online – issue 1289, pg 10). Ed Vaizey has had 148 meetings since taking over as minister responsible for libraries and has become the most lobbied minister – by telecoms companies. He has only had one meeting entirely concerned with libraries, none with campaigners. Saving libraries in Yorkshire – Guardian. Includes quotes from a pro-library WI spokesman who has set up a new WI in a library, a Conservative councillor delighted that Rawdon Library has been given a 12 month reprieve, an Addingham Library supporter keen to preserve it as volunteer-run and part of the council network. Scenes from Los Angeles’s teacher-librarian witch hunt – Boingboing (USA). What is your library worth to you? – Mount Vernon Public Library (USA). This handy site will calculate how much your library usage would cost if you needed to pay for everything. Dorset – Beaminster: not going without a fight – View Online. Three-week series of consultation meetings start amidst “absolutely outrageous” lack of publicity. Dorset – Lyme Regis: councillors opposed to taking over the town’s library service – View Online. Local councillors thought it unfair to do so as they were already effectively paying for it via council tax anyway. Lyme already has a great deal of volunteering so there was a feeling that a volunteer-run library would be a step too far. Dorset – Lyme Regis: Library is one of six that may survive closure – View Online. Six closures (out of the 20 proposed) may be “open to challenge” in the view os the council. Norfolk – Library hours could be cut – Bury Free Press. Public consultation on cutting all libraries’ hours by 10% started last week. Renfrewshire – Lochwinnoch library and annexe action group – Gryffe Advertiser (p.38). 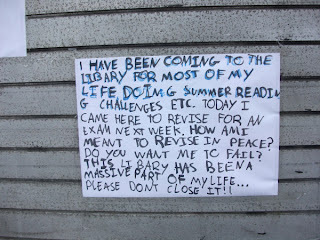 500 responses to campaigner’s questionnaire, locals not properly consulted on closure of library. Appeal to Scottish Ombudsman likely. Wokingham – Private libraries row hots up – Get Wokingham. No libraries to close but “one of the first tasks for the contracted company would be to conduct a full review of library locations to assess their efficiency”, confident of there being no job losses. Council expects saving of £200,000 (10%) in first year. Opposition (Lib Dem) councillor says ““I do not know what they’re trying to achieve with this other than palm the libraries off on someone else and then blame someone else when they shut them. It’s appalling.”. Council reveals it would have closed libraries otherwise. The BBC devoted a ten minute segment of Newsnight (at 26.51-38) to the fate of public libraries last night on the occasion of Alan Bennett speaking at Kensal Rise Library. It was a major hit on Twitter with great support being shown there for the pro-library cause. The Mail has also covered the story. The reporter at Kensal Rise was, unfortunately, sneering about public libraries, relating somehow the fate of a vital community resource to a hypothetical Richard Curtis comedy called “Libraries Actually”. The well-known actress Tamsin Grieg was allowed a short moment to point out the damage to small communities that closing libraries would have before she was invited to have a laugh about it. The main event, Alan Bennett, pointed out that privatising libraries has been on the Conservative agenda for 15 years, that all children do not have a computer and many do not have access to books. “Llibraries have to be local, they should be handy, they shouldn’t need an expedition”. He repeated his key phrase that “closing libraries is child abuse”. This is an unfortunately over the top quote that was used against him later on. On the question of why Alan was bothered about libraries, the reporter denigratingly said that libraries were not the sexiest of causes except if one was Joe Orton. Kensal Rise is one of six libraries (half of the total) in Brent (the BBC made clear it was “labour-controlled”) that will close. To a deliberately old-fashioned soundtrack of “Pennies from Heaven” a council statement said that the other half would improve. The report then went to the studio, with the pro-libraries side being represented by the author Tim Lott and the anti (quite how anti became very quickly apparent) Mark Littlewood from the Institute of Economic Affairs. Tim Lott pointed out that libraries provided an area of quiet and that they helped him considerably when he was growing up in poor area, also pointing out that children still need that space due to a lack of computers/room/books at home. Kensal Rise, he said, was an example of a community coming together to protect a vital resource. He did accept that cuts needed to be made, even suggesting an alternative plan to running the library via volunteers, a task made easier by the fact that there is no rent to be paid as the building is owned by All Souls College, Oxford. Mark Littlewood immediately started attacking the very concept of public libraries, saying that they are “increasingly an anachronism” and that they are not the best way of getting reading materials to people. When challenged on this, he suggested that people should buy secondhand books on Ebay and that 2 in 3 households have a computer. That this meant 1 in 3 people would not be able to have access to books even using his own statistics did not seem to be problem. Mr Littlewood then continued. He accused library supporters, entirely wrongly, of not wanting a single library, anywhere, to close, regardless of the circumstances. When challenged on where people would go for a space to study if libraries were to close, he suggested “comprehensive schools” could provide space and computers when the teachers went home and that libraries sat on “prime land” that could presumably be sold off. He pointed out the falling use of libraries among adults but strangely did not mention their increasing use by children. His finishing comment was truly impressive. He argued that Alan Bennett was rich and so that if he really wanted to support the Kensal Rise campaign, he should pay for it out of his own pocket. This tied in with his argument that if communities really wanted such a (to summarise) underused anachronism taking up expensive property and did not fancy using the local Comprehensive at night instead, then they should volunteer their time and money to do it themselves. The complete failure by the chief of the IEA to understand, or even to accept the reason for the existence of, public libraries is terrifying. The Institute is very much admired by the Conservatives and its thinking is very influential. It may help explain why the Government has so failed to do anything effective in supporting libraries. The bias shown by the BBC against saving libraries is equally troubling. It may be that it is an attempt by them to show that, after allowing Zadie Smith a prime spot defending libraries on Radio Four, they need to balance things up a little. It may also show that, like Mr Littlewood, many of them (to paraphrase Philip Pullman) in that organisation fail to understand what they seek to destroy. To help raise money for the campaign to save Kensal Rise Library and other libraries in Brent, see Brent Save Our Libraries. Campaigners march to No.10 in last-ditch battle to save libraries – South London Press. Five Lewisham libraries set to close on May 28, one completely and the other four given to community groups. No response from DCMS to campaigners’ requests for action. Don’t discard the librarians – Globe and Mail (Canada). People need a specialist who knows how to find the answer more than ever amongst the information overload. Libraries in a fine mess – Star. £700k owed and 10,000 books overdue in Surrey. London Library Consortium subscribes to smartsm to drive efficiencies around their shared collections – Booktrade.info. Half of all UK libraries, one-third of London ones, subscribe to automated stock selection. Mauger to urge WI to campaign for libraries – BookSeller. Leader of CILIP to talk to WI about campaigning for libraries this year. “The only effective test of any concept – from Tony Blair’s Third Way to Cameron’s Wellbeing – is the impact on policy. No 10 insiders offer two immediate examples. First, while it might make economic sense to close libraries and post books to former borrowers from Amazon, a wellbeing index would recognise the importance of libraries to communities and their quality of life. They are a binding agency at a local level. A government that took wellbeing into account as a formally recognised obligation would support a local library even though it was a more costly option.” Will Cameron’s idea of happiness last? – Independent. Kensington & Chelsea – North Kensington Library may be moved to new site to allow for land to be sold to private company/public school. 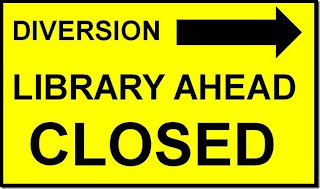 Merton – Donald Hope Library (Colliers Wood) will close on Fridays, West Barnes Library will be staffed by volunteers on Mondays from July. Brent – “Newsnight” to tackle Kensal Rise campaign – BookSeller. Will include an interview with Alan Bennett. This has prompted a Letter to Newsnight from campaigners. Gloucestershire – MP Richard Graham: apprentices, academies and regeneration – This is Glos. “I’ve gone to youth clubs, libraries, day centres, community centres and voluntary groups and worked with councils to find the best solutions in difficult times. We lose no bus services or police stations and shouldn’t see any loss of libraries.”. Library users expecting 10 libraries and 6 mobile libraries to close or be staffed by volunteers in Glos presumably splutteered when they read these comments. Kensington & Chelsea – North Kensington library may relocate – K&C Chronicle. Council denies that library may be closed and land sold off to private developers or private school. However, strong rumours remain that the library will be moved to another site. Merton – Volunteers drop plan to save Friday closure at Donald Hope library, Colliers Wood – Local Guardian. Decision made by Friends group that training would be too much for volunteers and that time should be spent on promoting the library instead. Suffolk – Staff leave with “gagging orders” – Public Service. Money spent on silencing staff leaving the council could possibly be better paid on keeping services, such as libraries, open. Wokingham – Woking plan to privatise libraries – Stop the privatisation of UK public libraries. Oxfordshire Libraries Users 1 Council 0. Maybe the horse will sing. For all those campaigners and voters, for Philip Pullman and for everyone, including children, who spoke out (in a library or outside it) or who wrote a letter or held a placard, the users of Oxfordshire libraries are grateful. The battle will continue in a few months when decisions are made on whether the 20 under threat this year will close in the next… but the decision buys time and with time anything is possible, maybe the horse will sing. Dispatch from Iraq – New Statesman. “That free public libraries are a democratising force is strongly apparent in Iraq, which suffered the near-obliteration of its libraries under the Ba’athist dictatorship.”… “As more of our libraries are closed down in the UK, it is instructive to remember just what an important role they play in a democratic society. In 1852, for instance, Charles Dickens opened the first free public lending library in Manchester, built upon the philosophy of providing “wisdom for all, regardless of background”. Roy Clare’s last words – M&H. Top 20 Facebook apps for book lovers – Galleycat. We’re not dragons in pearls, say librarians, we’re just misunderstood – Sydney Morning Herald (Australia). New South Wales is the only state that mandates every school has to have a librarian, but funding decreasing as colleagues fail to understand their role. Oxfordshire – None will close this year. Funding guaranteed until 2012. Wakefield – Westgate Library to be opened in 2012, merged with Wakefield Museum. Worcestershire – Council meeting May 2011 to be followed by public consultation, may include more volunteers and less opening hours, previous reports of threatened libraries unconfirmed. Essex – Voluntary charity tours libraries – Daily Gazette. This does not appear to be involved in recruiting volunteers for libraries. Leicestershire – Library hours set to be reduced in cost-cutting measure – Lutterworth Mail. Milton Keynes – Survey – Friends of Stony Stratford Library. Oxfordshire – Libraries get a stay of execution – Oxford Mail. Libraries will have secure funding until 2012 giving communities a chance to work out rescue plans for closing ones. Also covered by the BookSeller. Wakefield – Site share plan for library and museum – PSE. Wakefield museum and library could be on merged into the new Westgate Library building. Worcestershire – Library futures to come under scrutiny – Evesham Observer. Council meeting this week followed by public consultation. Increased “role” for communities, opening hours to be cut. This will be the second library authority in the country to be placed in private hands, the other being in Hounslow. For a full analysis of the pros and cons of privatising libraries, please see the page “Privatised libraries and Trusts”. Big Society signs up 100,000 digital volunteers – PublicNet. 5,000 are from public libraries. Books denied to 600,000 – TES. School library services in Gateshead, Cambridge, Sutton, Kent and Birmingham closed in the last year. ““It is an absolute disgrace. The Government doesn’t fund schools properly so schools have to make the choice between repairing the toilet roof and having a school library service” (Philip Pullman). Government is focussing entirely on schools and ignoring the vital council school library services. Also reported by the BBC. Alan Gibbons points out that OFSTED confirms school libraries are key. DCMS complicit in allowing the law to be broken? – Shirley Burnham’s Blog. Department aware of wide-ranging cuts in libraries infringing on the 1964 Act but unwilling to take any meaningful action. Four key tests – MLA. In his last day in post, Roy Clare suggests a test for the future is an “…improving and free public library service nationwide – is there an appetite to retain mechanisms and a will to work with local councils for a coherent public library service throughout the country, free at the point of use, and modernised according to changing local needs and digital demand; focused on the services more than the bricks and mortar? Hay Festival and the Travelling Suitcase Library – Walk you home. Voices for the Library will have a stall at the Hay Festival and will be selling badges. HMV sells Waterstones book chain to Alexander Mamut – BBC. Conditional offer based on £53m in cash. The aim is to make Waterstones bookshops more individual and local. “There are a million things you can do in your life without that. Get yourself down to the library and read a book.” Sir Alex Ferguson ponders banning Manchester United players from using Twitter – Goal. North Tyneside – £650k cut. Wokingham – Libraries to be privatised. Croydon – Adult Learners Week events in libraries Shhh! – Sanderstead Library Campaign Group. Lack of publicity for events suggests loss of staff has already been noticed. Doncaster – Next step in Doncaster’s sham consultation – Save Doncaster’s Libraries. Consultation only limited to local residents so some users may not be able to put forward their views, “this is local democracy at its worst”. Ealing – Lynne Reid Banks read-in at Hanwell Library – Ealing Times. Hanwell is under threat of closure, nearly 1500 signatures on petition to save it. Essex – Library opening times to be slashed across Tendring – Clacton Gazette. Several libraries will lose whole day opening due to cuts. Gloucestershire – Breaking news: Councillor Noble has library portfolio taken from here – FoGL. Councillor had previously said to LibDems “Your amendments would make the library plans as unsustainable as ours” (!) and was apparently unaware of legal implications. Hillingdon – Hillingdon wins best library innovator of the year – Hillindon & Uxbridge Times. Hillingdon’s record rests on factors including better bookstock, lighting and removing tiers of management. Lewisham – Lewisham library campaigners take protest to Number 10 – News Shopper. North Tyneside – Survey responses prompting changes to the library service – News Guardian. 2000 responses suggest ability to buy books and coffee will be looked at, changes in opening hours. Hard to tell where the £650,000 cut mentioned is going to come from. Suffolk – Call for review at Suffolk County Council’s £405,000 payout – Bury Free Press. Large amounts spent on “gagging” departing staff at same time as large cuts proposed for libraries. Also covered in Controversial council chief spent £400,000 on “gagging orders” to silence her disgruntled staff – Mail. In just three months, 13 gagging orders paid for by Suffolk. Alan Gibbons calls it a Suffolk punch in the guts. Suffolk – Save Rosehill Library – Youtube. Warwickshire – Libraries answer reader’s questions on the planned workshop on community library models – What’s In Kenilworth. Council appears to feel it is being generous not seeking to make a profit from the session on how to voluntarily run one of its closing libraries. Amazon.com selling more kindle books than print books – Amazon. “We had high hopes that this would happen eventually, but we never imagined it would happen this quickly” says founder. “We delivered our folders to both the DCMS and No 10 as arranged. Huge thanks to those who turned out to help. Better, that the police and authorities allowed us to stand right outside the offices of the DCMS. Even banners were tied to the columns! All the books, not wanted by Lewisham libraries, were given away, with leaflets. Plenty of photo calls, too! No 10 was great too, more photo calls!…” Pat and Peter Richardson, Users and Friends of Manor House Library. “I was interviewing a pupil in a foreign country last week and mentioned how public spending cuts meant libraries were closing in the UK. He look bemused. “Why would anyone want to do that?” he asked. Answers on a postcard, please” Chalk Talk: Independent. Newsflash: print isn’t dead – Futurebook. 4% increase in US print titles (cf. 169% for ebooks). Leeds – 13 to close (Allerton Bywater, Armley Heights, Belle Isle, Broad Lane, Holbeck, Ireland Wood, Kirkstall, Lofthouse, Osmondthorpe, Richmond Hill, Swarcliffe, Swillington and Swinnow) Rawdon and Cow Close libraries will stay open until March 2012 to allow volunteers time to organise takeover. Camden – Historians fear for the future of “irreplaceable” collection as libraries budget faces 25% cut – Camden New Journal. Camden Archives based at Holborn Library may be merged with Islington Archives or closed completely. Conwy – Conwy Council consults over libraries future – North Wales Weekly News. 7 out of 12 may close – consultation in two parts with “stakeholders” until end of May the a wider consultation in July. Leeds – Rawdon Library gets stay of execution – Wharfedale Observer. Rawdon Library will close in 2012 rather than in 2011. Friends group willing to take it over as volunteer run. Leeds – Council presses ahead with Leeds library plan – but two get last-minute lifeline – Guardian. Cow Close and Rawdon Libraries will stay open until March 2012 to allow for volunteers to take over. 13 others to close this year. Mobile libraries will serve areas. Council Leader “many people at Allerton Bywater see the introduction of a mobile service as an improvement to the existing service, which was only open a few hours on a Saturday. Reported by BBC as Leeds City Council to close 13 libraries.